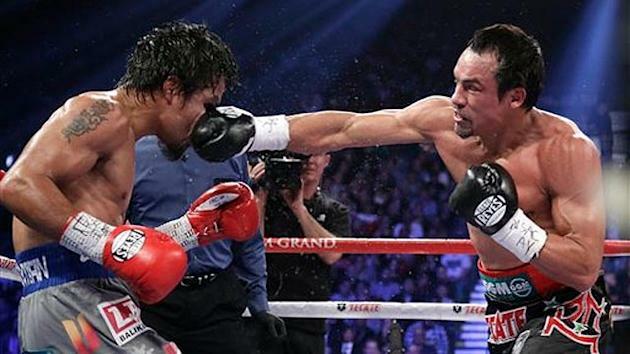 LAS VEGAS – Juan Manuel Marquez is asked about Manny Pacquiao a lot. He was asked about Pacquiao when they were fighting. He was asked about him when they were thinking of fighting. He was asked about him when they finished fighting and thought about fighting again. And, most annoyingly, Marquez is asked about Pacquiao when he is preparing to fight someone else. There is no way, it seems, for Marquez to get out from underneath the very large shadow cast by Pacquiao. If Marquez is around and there is someone with a microphone nearby, be very certain that the topic of Pacquiao will come up quickly. But Marquez's answer to yet another query about the Filipino superstar – why did you turn down more money for a bout with Pacquiao and instead choose to fight Timothy Bradley? – says much about the man he has become. Marquez grinned bemusedly as he waited for a question he probably recited verbatim. 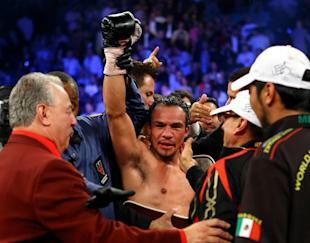 "You know, Manny Pacquiao is a great fighter and we had a lot of great fights together," Marquez said. "But I beat him. I knocked him out, cold. I think I won the other fights, but in the fourth fight, I knocked him out and proved who's best. 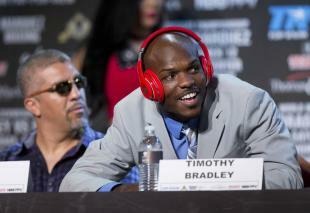 And he's a great fighter, but there are a lot of them and Timothy Bradley is one of them. He has that win over Pacquiao, and he is very tough. He's a fighter, a real fighter. "When I retire and go away from boxing, I don't want anyone to say, 'Marquez ducked this guy.' I spent my life fighting the best. I want to continue to fight the best for as long as I can do it. And Timothy Bradley is one of the best." Bradley holds the WBO welterweight title and will put it up for grabs when he meets Marquez in the main event of a pay-per-view card Saturday at the Thomas & Mack Center. Winning that belt is clearly a great lure and as much of a motivating factor for Marquez as his $6 million purse guarantee. It would represent his fifth championship in five weight classes and put him in the most elite company. Only five men – Thomas Hearns (5), Sugar Ray Leonard (5), Floyd Mayweather (5), Oscar De La Hoya (6) and Pacquiao (8) – have won titles in five weight divisions. He comes from a boxing-mad country with a rich tradition in the sport, but he'd be the first Mexican to ever win a world title in five different weight classes if he could pull it off. It's a significant feat, and one Marquez is very mindful of. "You have to have discipline, and you have to have talent and a lot of things to do it," Marquez said. "It's not easy. But that makes it mean more." If he beats Bradley, though, there are many who would consider it a tainted belt because of his association with strength and conditioning coach Angel Heredia. Heredia gave performance-enhancing drugs to athletes during the Bay Area Laboratory Co-Operative (BALCO) scandal and testified as a government witness against track coach Trevor Graham. He's a controversial figure who has engaged in a very public spat with BALCO founder Victor Conte on social media. Marquez looked demonstrably more muscular after working with Heredia, though he brushed off accusations he used performance-enhancing drugs. For the fight with Bradley, the contract called for both men to be tested by VADA. Heredia and Marquez balked at that though, saying that Conte's close affiliation with VADA tainted the testing in his mind. Top Rank's Bob Arum hatched a plan to hire a WADA-accredited lab to do the testing and send the results directly to Nevada Athletic Commission executive director Keith Kizer. Marquez has complied with that process, but Bradley did both. He went through the VADA program, as well as the Arum plan. Bradley was disgusted by Marquez's refusal to do VADA, and said he considered pulling out of the fight. "I'm not saying he's on anything, because I'll be sued if I do, but it's damn suspicious," Bradley said. Marquez has never failed a test, but as Dr. Larry Bowers, the chief science officer of the United States Anti-Doping Association said in an affidavit in the Lance Armstrong case, the lack of a positive test is not by itself proof that one did not dope. The suspicions are tainting what should be a celebrated run to the finish for a man who has toiled so long in the shadow of others. With any luck, he could be 60-2 and already holding the fifth title. The only losses in his career that came without any questions were his 2005 loss to Chris John in Indonesia and his 2009 defeat to Floyd Mayweather. He lost his pro debut by disqualification, a fight he was en route to winning. And many believed he deserved the decision in losses to Pacquiao twice and Freddie Norwood, as well as in a majority draw with Pacquiao. Marquez can't silence the critics, though, so he's decided to ignore them and keep winning fights. Winning is always the best answer. "I am happy I am drug-tested because I am clean," Marquez said. "I have always been clean. I have worked hard my whole career to get these wins and everything I have. But I have worked smarter as I have gotten older and learned more. "I know what I have done. I know that what I have, I've gotten by working hard. And for as long as I am around, that's what I will do." If he defeats Bradley and claims that welterweight belt, the same one that used to belong to Pacquiao, the questions about his nemesis will pop up again. Marquez, though, will smile and answer politely, but he insists the rivalry is over. "There is no point," Marquez said. "I am glad people liked our fights, but that chapter is closed and I have moved on." He's moved on, even if a sizable portion of the fan base has yet to do the same.